The Estate Planning Ticker | My Name’s on Mom’s Checkbook – What Does That Mean? 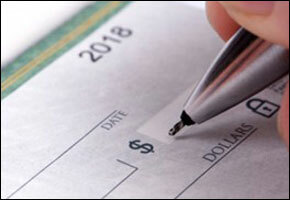 This is the run-of-the-mill situation where mom or dad adds your name to their checkbook, though it can apply to being given access to other type of accounts as well. The important thing in this situation is not to confuse access with ownership. This lack of true ownership also means that when the parent passes away, the account will ordinarily be part of the estate and get distributed through probate; the additionally named people may not personally access it. If there is a death beneficiary named on the account (see category #3), the firm holding the funds may automatically pay out the proceeds to those named. Otherwise, only the executor or administrator of the estate is permitted to access the account. *It is possible for two people, including a parent and child, to pool their own separate funds in a common bank account. Be mindful that the full value of the account will be treated as owned by the parent when valuing assets for probate, estate taxes, and Medicaid applications, unless there’s clear proof that the funds belong to the other account holder. For this reason, it’s a poor idea to pool funds with an elderly parent unless there’s a significant benefit to having a single account and you can definitively prove which portion of the account was contributed by you. **Assuming the permission was already there. Absent permission, it of course remains a theft. Even though a fiduciary’s name may appear first on an account, they have the least personal rights of the three. In most cases, the fiduciary is legally obligated to manage those accounts on behalf of the true owner and in the true owner’s interests, and is likely barred from making use of account assets even where the true owner would permit it. Powers of attorney are an exception to this rule. A power of attorney provides the opportunity to assist the grantor in managing affairs, but creates no obligation to do so. Additionally, if the document permits the attorney in fact to engage in estate planning, she may be able to make gifts to herself, other family, or charity, as well as shuffle assets between accounts and/or place them in trusts, provided you reasonably believe it’s in the best interests of the parent. That said, self-gifting and other estate planning can still be tricky and raise suspicions, and shouldn’t be undertaken without the assistance of an estate planning attorney. As I noted in Section 1, a financial account with added names on it will still have to be collected by the executor of an estate and distributed through the probate process. This is not the case, however, if the account includes a provision designating one or more pay-on-death beneficiaries. This includes life insurance policies with a beneficiary other than the insured individual’s estate, POD bank accounts (also called “Totten trusts”), joint and survivor annuities and investments, as well as any IRA, 401(k) plan, brokerage account, annuity contract, or bond where a survivor beneficiary has been designated. Bonds and bank accounts normally are created with the beneficiaries named; banks, brokers and insurance companies usually issue their own forms on which beneficiaries can be added and changed. Being designated as a survivor/death beneficiary will not grant access or create any obligations to the account, though a beneficiary may be – and often is – listed on the account for one of the other reasons mentioned. It’s sole purpose is to give then named people the right to receive the account balance on the death of the owner. Where beneficiaries have been named, the assets will normally be issued directly to them from whatever company maintains the account, without having to pass through the probate process. However, the value of the accounts will still be counted as part of the estate for determining the amount of the probate fee and any state or federal estate taxes that may be due. I hope this short lesson is helpful in your understanding of your role towards the finances of others you have been brought into the fold on. If you would like further advice on Connecticut estate planning and elder law, please call me at (203) 871-3830 or email Scott@ScottRosenbergLaw.com. This entry was posted in Connecticut, Elder Law, Estate Planning, Trusts & Trustees. Bookmark the permalink.